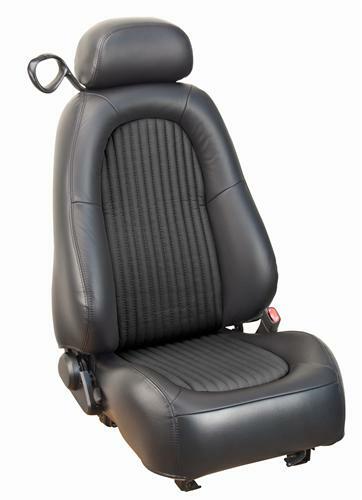 Replace your worn & torn leather upholstery with this TMI 2001 Mustang Bullitt Seat Upholstery. Will not work with stock seat foam! This reproduction Mustang Seat Upholstery is intended for Bullitt trim level 2001 Mustang coupe with sport seats. The upholstery features vinyl back & sides with a leather seating surface & perforated leather inserts. The color is Dark Charcoal. This leather upholstery will not work with the stock front seat foam. If the seats in your 2001 Mustang Bullitt have seen better days, a set of new seat upholstery for your New Edge Mustang is just the ticket! Just follow the instructions on our Mustang seat upholstery installation blog by removing the factory seat upholstery and re-cover your Mustang seats with this reproduction kit to make the seats in your Mustang look and feel like new again. This Mustang leather upholstery kit features OE style patterns to match the seats that your Mustang came with from the factory. The material used is not factory exact, but is the closest match currently available. The factory link weave insert material is no longer available so perforated leather inserts are substituted in. New replacement front seat foam is required when installing this 2001 Mustang Bullitt Leather Upholstery. The mounting points have been improved compared to the factory foam & the bolsters have been more aggressively designed. The use of this new foam on 1999-2004 GT seat frames will allow you to upgrade to Bullitt upholstery! Rear seat reuses foam and comes with installation kit. This seat upholstery is patterned after the original style upholstery in your vehicle. The material itself does not match the OEM material, but it is the closest available match. Upholstery age, sun fading, and other variables may cause color differences. Seat upholstery is highly recommended to be installed by a trained professional. If you are installing the upholstery yourself, you will need a hog ring and plier kit.